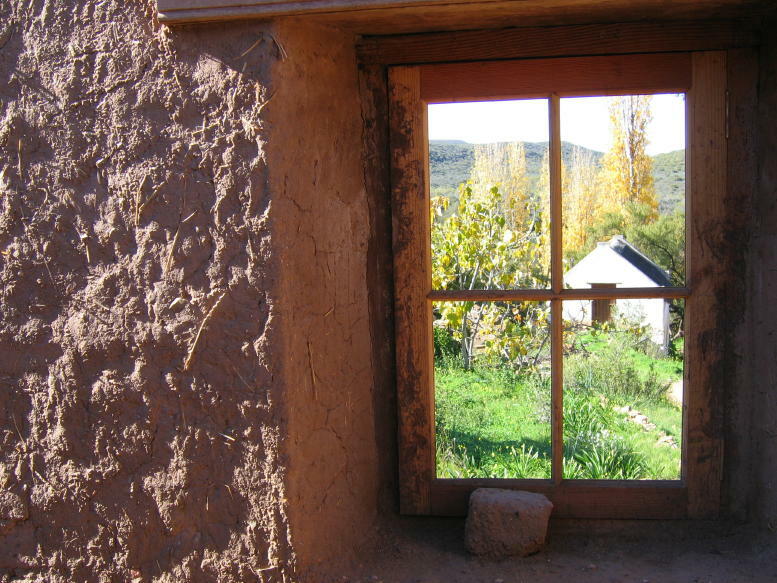 There is a timeless appeal to the old clay cottages that dot the Karoo landscape. Many artists are drawn to them. The older generations lived in closer harmony with nature, and their buildings functioned as an aspect of their environment, and not as separate entities as they do today. The cottages were built on a human scale, with form following function. They have a wonderful simplicity about them. The windows are small and the walls thick, effectively keeping the internal temperatures more ambient. The doors are low, and are made from simple wooden planks, and the floors are from earth. Building materials were expensive, and had to be carted over long distances and through rough terrain. Most buildings were created from what was to hand in the surrounding landscape, leaving tantalising clues to what had been in days gone by. The rough-hewn yellow wood doors and stinkwood doorframes found on the farm speak of a time when this area was once forested. Often provision was made for future generations by the planting of what would be required for building. So it is that the farm has a grove of poplar trees for planks and roofing, ‘Spaanse Riet’ for the ceilings, and a large stand of traditional bamboo with multiple uses – still present two centuries later. When the farm was sold in 2002, the then owners found all the buildings in various stages of disrepair and disintegration. One, dubbed the ruin, had lost its roof over 25 years previously. The walls had melted away to the window level, and trees were growing inside the walls. Most people’s response to the property was to demolish what was here, and to start again. The approach they took was different. The presence of the watermill made this property one of historical significance in the area. In addition the buildings had remained very close to their origins, in part due to economic necessity. It was decided to restore the cottages using traditional materials and techniques, and to stay as close to the original as possible. The biggest challenge was to create a space that could function in the 21st century without losing what they had fallen in love with in the first place. To find a balance between what the buildings looked like from the outside, and what it actually feels like to live in them - in a present day context. This project was an amazing journey into the discovery of the old ways, with generous souls remembering and sharing their recipes that had been used for generations. Of the aloe’s that were tapped for their juice, which was then mixed with milk to preserve wood, and how the dung floors were laid. Originally, the people who toiled the fields, also built the houses. 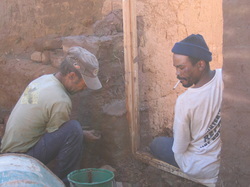 The restoration team was made up of local farm labourers, both male and female, trained in situ by Jill Hogan of McGregor. Jill’s expertise, knowledge and assistance was invaluable. As far as possible they tried to follow the ethos of using what was to hand. Poplar trees and Bluegums were felled for roofing beams and reeds cut and cleaned for the ceilings. Interior walls that had been later additions were carefully dismantled for re-use. 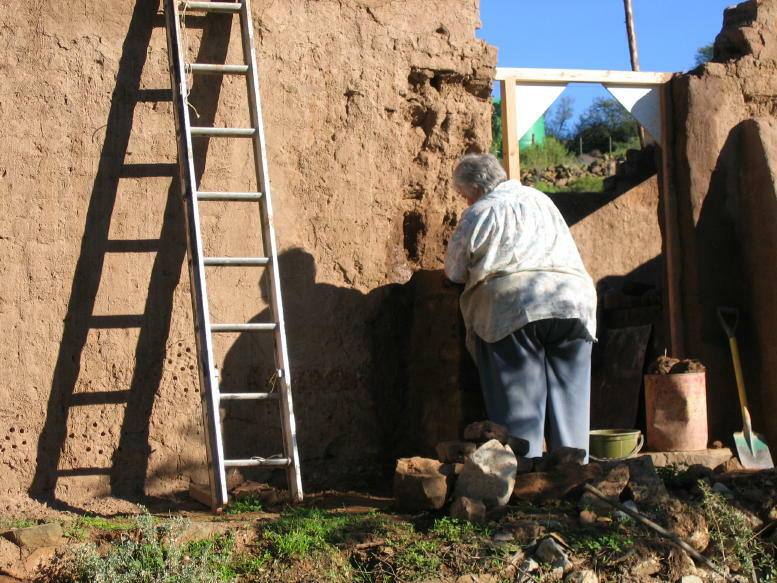 What could not be reused was reworked into cob, including the clay rubble from the disintegrated walls. Wooden lintels that had to be removed were reworked and used elsewhere. Old wooden windows became cupboard doors, floor planks became shutters and cupboards, and a Victorian fireplace found in a loft, was incorporated into The Barn. Earth is an amazing medium to build with. It is very forgiving, and behaves very differently from conventional brick and cement building. As its strength comes from mass and not structure, cracks that were wide enough to put your arm through could be repaired without having to rebuild the entire wall. 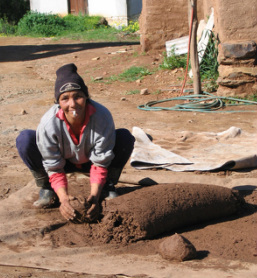 It’s a much quieter and gentler process than working with cement, and can be done using unskilled labour – making it very empowering. No cement was used in the entire restoration process. The resulting handmade quality of the cottages is a delight to live in. The unevenness of the walls allows a play of light to dance on the whitewashed surface that speaks to the soul. The hand work is also very distinctive. As you walk through the cottages, you will see the ‘signatures’ of the builders – the way that Dawid's angled his windows, Frans's stonework and Steven’s plastering.